Cichlids are small, attractive fish who come in a vast range of sizes, coloration and patterning. Some 1,400 species of cichilids are recognized, about 1,100 of which come from African lakes. Because of their bright colors and personable nature, cichlids are favorites among aquarium fish. Of the various cichlid types, five main species have bright yellow or orange coloring. The electric yellow cichlid is one of the most recognizable cichlids because of his striking yellow coloring. He originates from African waters and is also called the yellow lab and the electric yellow lab cichlid. Some adult species have horizontal black stripes and vertical bars across their bodies, providing added visual interest. 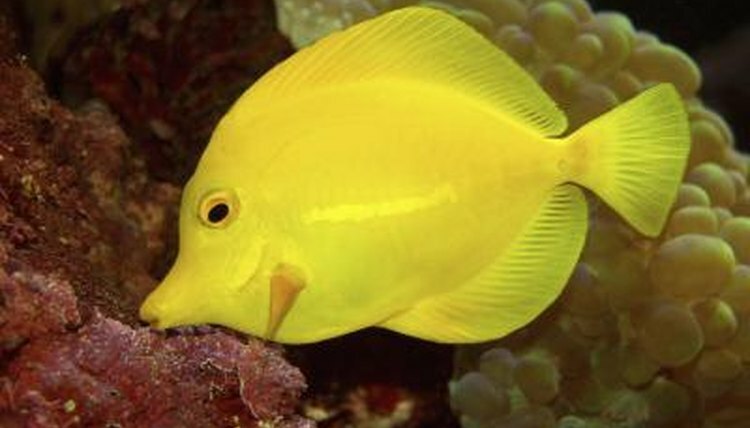 The electric yellow cichlid is generally more peaceful and timid than his fellow African cichlids, but he will act aggressively toward other fish if he perceives a threat. The electric yellow cichlid lives in the waters of Lake Malawi near the islands of Charo and Mbowe. The orange Neolamprologus Leleupi cichlid is one of the smaller cichlid species, attaining a typical size of 4 inches. The fish originates from the coastal waters of Southern Lake Tanganyika, Africa. Orange Neolamprologus Leleupi cichlids have elongated bodies. Some have large mouths that are outlined in black or blue. Of the cichlid species, this fish is slow-growing and can take years to reach full sexual maturity. The red zebra African cichlid is not just a red-colored species. The fish also comes in brilliant yellow and peach skin. He has bright yellow spots on his dorsal fin and tail. The fish has many names, commonly referred to as the zebra cichlid, tilapia zebra or the false zebra mbuna. The red zebra cichlid is a bully by nature and will often torment nearby fish or tank roommates. He comes in various sizes, ranging from 1 to 5 inches. The midas cichlid is a large, eye-catching cichlid known for bright yellow coloring. He hails from South America and has now become a common large-aquarium fish in the United States. They are frequently confused with the red devil cichlid because they have similar coloring, but the midas is slightly smaller. He ranges in size from 10 to 14 inches. Midas cichlids are generally peaceful fish, compared with other large species of his kind. However, in captivity, they need plenty of room to swim, or their aggression may increase. The red devil cichlid is aptly named for its bright colors and aggressive nature. The fish can be bright red, white or bright yellow. He is one of the most ferocious of the South American cichlids as well as one of the largest. The red devil cichlid reaches up to 15 inches in size. Some of the more colorful varieties have a black-tipped tail and black-tipped fins. The red devil's lips are thick and rubbery, and outlined in either black or orange. He is not afraid to use his large teeth or strong jaws to attack other fish, especially other red devil males.